These materials are the most open metallic skeletal structures available. Their resistance to gas or liquid flow is extremely low, since the solid content of the structure is only 6% or so by volume. 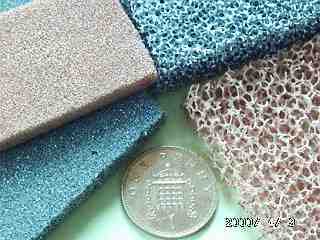 Foam metals are prepared using a plastic sponge as a precursor. The sponge is evenly coated with tiny metal particles and is then burnt away, leaving a metal skeleton in its place. This is densified by high temperature firing and the result is a pure metal or alloy having the same structure and pore arrangement as the foam, but shrunk by a certain percentage during the process. Applications usually involve gas or liquid flow through the foam, and usually the problem is to provide a structure with the minimum of restriction to flow. The metal foam can be used to prevent ingress of dirt or foreign bodies, or it can be a structural part in its own right, perhaps supporting a sensor or thermocouple within the fluid/gas stream. Various metals are available in foam structures: Copper, Stainless Steel, Nickel, FeCrAl alloy are all available. The pore sizes of foam metals lie in the range 120 pores per inch (the finest) up to around 10 pores per inch. The foam is quite easily crushed, but can be cut with a high speed fine saw or can be wire-eroded if greater control and accuracy is required. Ceramic materials can be formed into foams in the same way, though we don't have a photo of these. They have the usual ceramic properties of great heat resistance and good corrosion resistance too, but are naturally very friable indeed in such open structures as these. They are often used for straining molten metal alloys in casting processes.